In the past year, there has been increasing interest in and awareness of Authorized Generics (AGs) by supply channel participants. Several manufacturers have launched AGs before equivalent ANDA generics have been approved. Despite the increasing prevalence of AGs, Pharmacy Healthcare Solutions, Inc. (PHSI) recently surveyed 200 pharmacists and uncovered that two thirds could not define an authorized generic. This article should provide pharmacists with additional insights into authorized generics. According to the FDA, an authorized generic is defined as “an approved brand name drug that is marketed without the brand name on its label. Other than the fact that it does not have the brand name on its label, it is the exact same drug product as the branded product.” Authorized generics enable innovator manufacturers to sell their product via another NDC number as a generic. The AG is sold at a different, lower price than the approved innovator (NDA) product. Authorized generics are most commonly sold via their generic or chemical name, although they can also be sold as branded generics (e.g. oral contraceptives). Authorized generics are made under the same process as the originator brand and generally have the same size, shape and markings. Their inert components and excipients are also the same as the innovator, unlike ANDA generics. A comparison of brand, AG, and ANDA drugs can be seen in the chart below. For states that use the Orange Book for generic substitution guidance or list it as a reference source, pharmacists should be able to substitute an AG for the innovator product, just like an A-rated ANDA generic drug would be substituted. Pharmacists should remember that AGs receive the same Orange Book code as their innovator product. Generally, this means that both the AG and innovator are A-rated. Recently, however, AGs have been introduced for non-A-rated innovator products. This can occur when AGs launch prior to the availability of an ANDA generic. In this case, the innovator product would be “Not Rated”, or NR, and the AG would also receive a “Not Rated” rating. A second scenario can occur when the innovator product is B-rated. This happens when two brand products have been approved via the 505(b)2 process for the same active ingredient, strength, and route of administration. Because both brand products are pharmaceutically equivalent but not bioequivalent, an Orange Book B rating is assigned to these brands, indicating that the brands are not interchangeable. Because the innovator is B-rated, an AG launched to this product would also be B-rated. According to state laws where the Orange Book is referenced, in these situations, the AG is still substitutable for its innovator product, as the AG is identical to the brand, innovator product, despite the B ratings. An example of this can be seen with Mylan’s Epinephrine Auto Injector (NDC 49502-0102-02). The innovator, EpiPen, is a BX-rated product to Adrenaclick (Amedra Pharmaceuticals). Because EpiPen is BX-rated, its Mylan AG also has a BX rating. However, the Mylan AG is still an appropriate generic substitute for EpiPen. Because the EpiPen is BX-rated to Adrenaclick (Amedra Pharmaceuticals), the Mylan AG is not a generic substitute for Adrenaclick. Anecdotally, we have heard of pharmacists concerned about dispensing the BX-rated Mylan AG for Mylan’s EpiPen because of the BX rating. There are 852 unique AG prescription products listed. Based on multiple package sizes, this amounts to a total of 1,169 NDCs. 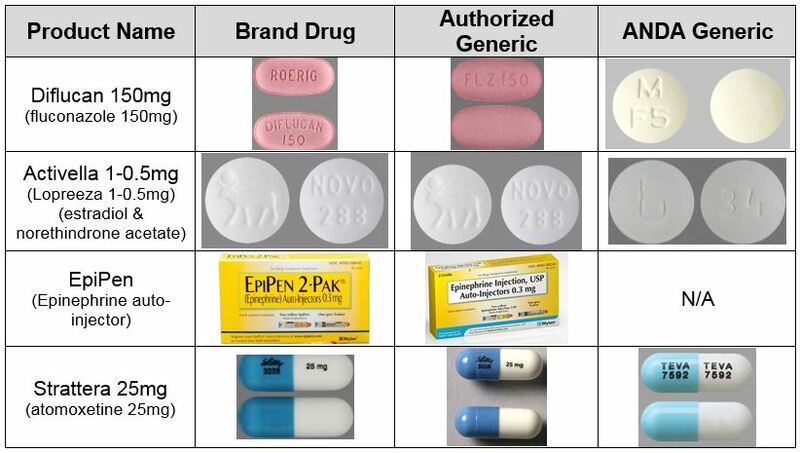 Of the 852 unique AGs, approximately 3% have branded generic names (e.g. Ocella, Lopreeza, DermacinRx), while the remaining 97% of products are chemically named. Greenstone is the most frequently seen labeler in the AG space (242 AG NDCs), followed by Sandoz (154 AG NDCs), and then Prasco (106 AG NDCs). Although not directly related to the purchase price, when looking at the current AGs in the market where the brand product is still active, the published WAC price is approximately 48% lower than the WAC price of the corresponding brand. AGs provide alternative generic supply options for all stakeholders. Pharmacy costs decrease for generics as the number of suppliers increase. Patient satisfaction with generics may increase, as product appearance differences are minimized with an AG. Although many benefits can be seen by using an AG, cost is often the deciding factor when pharmacies choose a preferred generic manufacturer. When pharmacy chains use a wholesaler source program for purchasing, the wholesaler decides on the preferred generic. A preferred generic helps to ensure product uniformity across pharmacies in a chain and enables pharmacies and buying groups to negotiate competitive prices. Authorized generics may be the preferred generic product if their manufacturer is the successful bidder. Even if they are not the preferred generic, AGs may be a purchasing option in most wholesaler systems. Interestingly, PHSI has found that most pharmacy dispensing systems do not flag products as authorized generics or have specific fields in their drug file that contains this information. The recent awareness of AGs at a consumer level (epinephrine auto-injector AG and salmeterol/fluticasone inhaler) may lead to consumer inquiries about these products. PHSI hopes that this overview will enable dispensing pharmacists to address questions and make informed product selection decisions when evaluating generic product options for their patients. According to the FDA, only 22 novel new drugs were approved in 2016. This is a 50% decrease from 2015. Novel drugs, or new molecular entities, are defined by the FDA as “products containing active moieties that have not been approved by FDA previously, either as a single ingredient drug or as part of a combination product.” After two record-breaking years of new drug approvals, 2016 is a bit of a letdown for prescribers and patients hoping for new, innovative therapies. Last year was the lowest number of novel new drug approvals since 21 drugs were approved in 2010. The chart below shows the trend in the number of new drug approvals for the last six years. Similar to 2015, the largest number of products approved in 2016 were indicated to treat different types of cancers. For example, Lartruvo was approved to treat soft tissue sarcoma; Rubraca treats ovarian cancer. Venclexta is indicated for chronic lymphocytic leukemia, and Tecentriq treats bladder cancer. All of these oncology agents were breakthrough therapies that received FDA priority reviews and accelerated approvals due to the positive implications for patients. When reviewing all 2016 approvals, priority review is the new norm vs. the exception, as 68% of all 2016 approvals had a priority review. This could also indicate that few manufacturers are pursuing follow-on drugs in therapeutic categories that already have multiple available drugs. The same drug may fall into multiple categories. 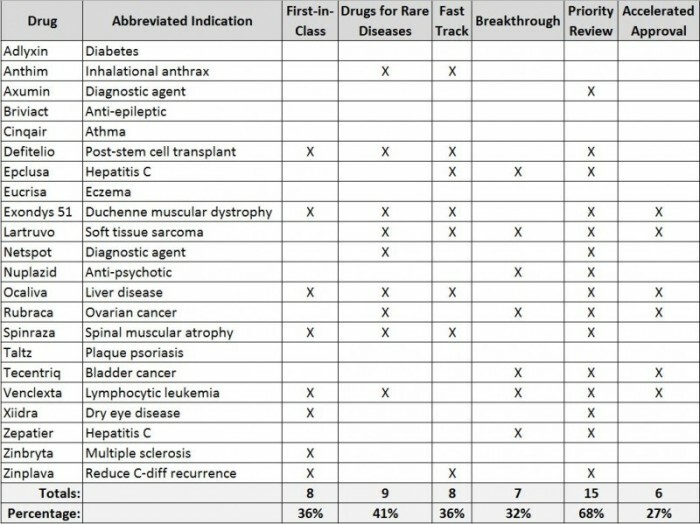 The chart below summarizes the 2016 novel drug approvals with special distinctions and/or expedited approvals, as noted by the FDA. 2016 also saw a number of first-time generic launches. The biggest generic launch of the year was generic rosuvastatin (Crestor). Other notable brands losing patent protection and becoming availability generically included Benicar (olmesartan), Tamiflu (oseltamivir), and Zetia (ezetimibe). There were a few notable generic specialty launches in 2016 including imatinib (Gleevec) and valganciclovir (Valcyte), reducing the cost for patients taking these medications. Although generics are now more common in the specialty space, brand drugs still dominate specialty pharmacy, and PHSI estimates that only 6 of the 22 new drug approvals are traditional retail pharmacy products. As 2017 unfolds, look for more of the 2016 approvals to become commercially available and appear on drug formularies. Due to high costs and limited patient population sizes, we anticipate many of these agents being placed on specialty drug tiers due to the high rate of 2016 approvals for drugs treating rare disease states. PHSI expects this trend to continue in 2017 and will report on the new approvals and their effects on the industry. The entire PHSI team would like to congratulate Bonnie Mattiko on her retirement, effective December 29, 2016. 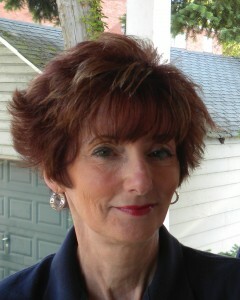 Bonnie provided administrative support to PHSI consultants for ten years. Many of you know Bonnie from her emails, telephone calls, and persistent follow-up for scheduling meetings for PHSI consultants at industry conferences. As Bonnie begins her retirement, she will continue to reside in Pittsburgh, but expand her traveling to visit her sons and granddaughters. We all wish Bonnie well in her retirement. Terry Johnston will now be handling PHSI meeting scheduling. Starting in 2017, there will be 41 million beneficiaries enrolled in Medicare Part D plans. 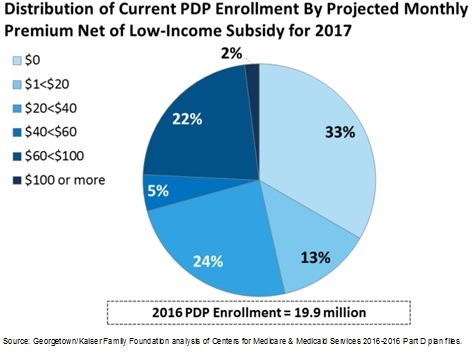 About 60% of these beneficiaries are enrolled in stand-alone prescription drug plans (PDPs), while the remaining 40% are in Medicare Advantage plans (MA-PDs). Although the total number of Part D beneficiaries has not substantially changed since 2016, the premiums and deductibles imposed on these beneficiaries is increasing, and plan choices are decreasing. In the last ten years, PDP premiums have increased over 60%. The weighted average monthly premiums for PDP plan members are expected to rise by 9% from 2016 to 2017. This will make the average monthly PDP premium $42.17 (excluding low-income subsidy adjustments), with wide variations from around $17 per month to over $70 per month, based on the plan. One-third of PDP enrollees do not pay any premiums because of low-income subsidy (LIS) benefits. The Kaiser Family Foundation projects the 2017 monthly premium distribution to be as follows. In addition to premium increases, deductibles are expected to rise by 7% in 2017. Meanwhile, the monthly Social Security benefits will see a 0.3% cost-of-living adjustment. For senior citizens on a fixed income, these large Medicare premium and deductible increases could severely strain finances for many. Shifts in cost-sharing for out-of-pocket expenses are also taking place. Almost all PDPs have five cost-sharing tiers, with two generic tiers, two brand tiers, and one specialty tier. Although percentage-based coinsurances have been popular for the specialty tier for many years, many non-preferred brand tiers are now implementing coinsurances vs. flat-dollar copays. In 2017, the threshold for a specialty drug will also increase to $670 for a one-month drug supply. This limit designates many injectable, high-touch products as specialty drugs. However, several oral drugs often thought of as retail products may hit this threshold and fall into the specialty tier, including Absorica, Fycompa, Januvia, Latuda, Nucynta ER, Opana ER, and Saphris. Manufacturers setting or increasing drug pricing should be conscious of this specialty threshold, as patient pay and pharmacy reimbursement amounts can be greatly impacted. To promote use of lower cost generics, approximately one-third of PDPs have implemented a $0 copay preferred generic tier. Compared to the models of the past decade, this formulary change shifts more of the costs for non-preferred brands to the patients. It incentivize them to curtail the use of high-cost medications, when lower cost, equally efficacious options are available. The average Medicare Part D enrollee had a choice of 22 PDPs in 2017. Based on the state in which they reside, this number varied from 18 to 24. Although this is still an acceptable number of choices, it is the lowest number of options since Part D was implemented in 2006. This decrease is likely caused by several factors, including industry consolidation. As 2017 approaches, PHSI recommends that pharmacists prepare to discuss increasing costs with patients who may be surprised when their prescription costs change. Manufacturers should monitor their products’ tier placement and evaluate if any significant copay/coinsurance changes will affect their business. 2017 promises to be an interesting year for healthcare, so stay tuned for more updates in our coming newsletters. PBMs and health plans have finalized their 2017 drug formularies, and payers have announced the products on this year’s highly anticipated formulary exclusion lists. While many of the drugs remain the same as the previous year, the increased presence of biosimilars and generic specialty drugs has caused some interesting changes for the exclusion lists. The hyperinflation of drug prices has also prompted payers to evaluate the medical necessity of these drugs. For CVS, a unique hyperinflation drug category now exists on the exclusion list. CVS has stated that they will evaluate drug price increases on a quarterly basis and potentially remove these items from the formulary when clinically appropriate alternatives are available. There are ten items identified as “hyperinflation drugs” on CVS’s 2017 formulary exclusion list, including DexPak and Zegerid. Valeant, who grabbed headlines earlier this year with many of these drug price hikes, markets both of these products. Interestingly, Express Scripts (ESI) includes none of these ten hyperinflation items on their 2017 exclusion list. One of the most meaningful changes to the CVS Health formulary exclusion list is the preference for biosimilars and follow-on biologics over their comparator brands. The exclusion of Gleevec, Lantus, and Neupogen in favor of generic imatinib, Basaglar, and Zarxio sends a strong statement. CVS is looking for significant savings by removing these high cost biologic or specialty products in favor of covering newer, generic alternatives. CVS is also excluding brands Crestor and Nexium now that generic version of the drugs (rosuvastatin and esomeprazole) are available. These changes could help to control rising premiums and costs if a portion of the realized savings are passed on to the patients. For Express Scripts, one of the most interesting exclusions is alogliptin and alogliptin/metformin, the generic versions of Nesina and Kazano. Earlier this year, Takeda entered into an agreement with Perrigo to launch authorized generic versions of their alogliptin and alogliptin combination products, Nesina, Oseni, and Kazano. Takeda hoped that by launching a generic in an all-brand category, they could capture preferred formulary status. 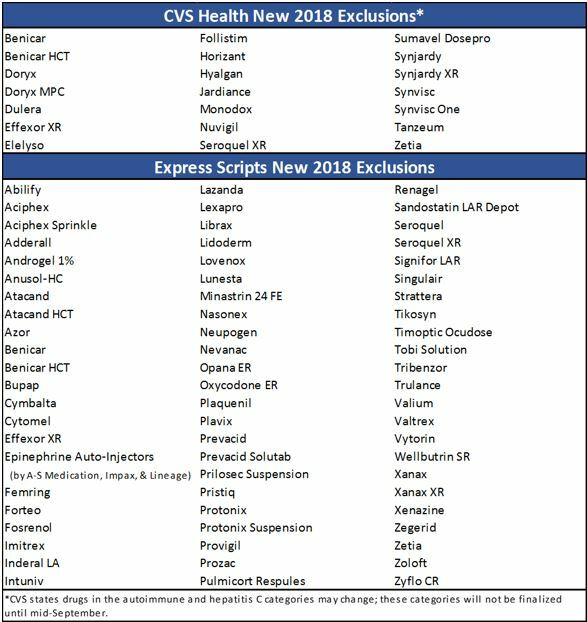 However, likely due to launch prices, it is clear that this did not happen, as both the brands (Nesina and Kazano) and their respective AGs (alogliptin and alogliptin/metformin) are now listed on Express Scripts’ 2017 exclusion list. Interestingly, neither Oseni nor its alogliptin/pioglitazone AG are included on the exclusion list, but this could change as Express Scripts evaluates products in the future. 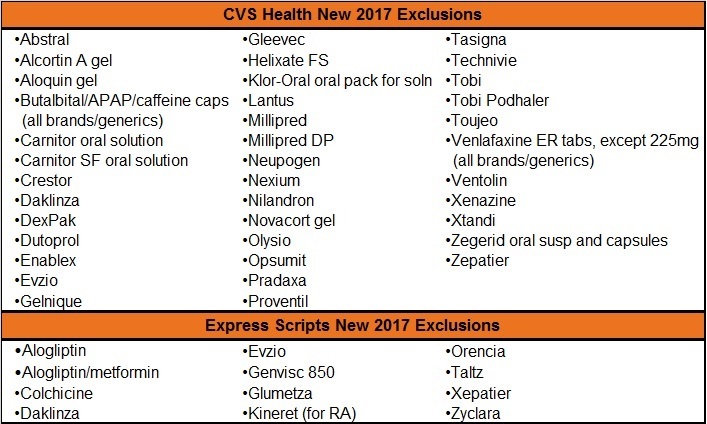 The chart below lists new products on the CVS Health and Express Scripts 2017 drug exclusion lists that were not present on the 2016 lists. The recent push to focus on value-based healthcare through accountable care organizations (ACOs) is changing incentives for physician practices and health care systems. Incentivized care is also now moving into the pharmacy world. With more focus than ever on managing outcomes, improving adherence, and preventing adverse reactions, pharmacies are becoming contractually responsible for whether or not patients meet their goals. Although pharmacists have been dealing with adherence and safety issues for many years, pay-for-performance models put new focus on these issues by providing direct financial incentives or disincentives. Medicare plans have been using adherence ratings to help determine eligibility for preferred pharmacy networks, and the commercial world is now looking to adopt these metrics as well. Using Pharmacy Quality Solutions’ (PQS’s) Electronic Quality Improvement Platform for Plans and Pharmacies (EQuIPP) system, pharmacies can track their performance, and health plans can provide bonuses to the top pharmacies. CVS/Caremark Silver Scripts plans implemented Pay-for Performance in 2014 when they provided bonus checks to pharmacies who out-performed their competition. The pharmacies were evaluated using four of the star measures, and the plan paid bonuses based on the pharmacies’ scores and number of patients served. Another bonus-based plan, the Inland Empire Health Plan (IEHP) instituted one of first large-scale pay-for-performance pharmacy programs. Working with PQS, the California health plan has enacted eight measures that track adherence, asthma control, generic dispensing rate, and use of high-risk medications in the elderly. In this rewards-based system, pharmacies receive points when they meet or exceed the benchmarks, and the plan’s payout to the pharmacy is based on the points received. Pharmacies who do not meet the benchmarks are not penalized, but they do not receive additional rewards payments. This well-laid out plan may serve as a model for other pay-for-performance payers, since the benchmarks are easy to follow, and the EQuIPP system makes it simple for pharmacists to track their progress on an ongoing basis. Click here to read more about the IEHP’s 2015-2016 pay-for-performance plan. Recently, Humana announced an amendment to their Pharmacy Provider Agreement covering the 2017 part D plan year. Humana plans to withhold $5 from each eligible claim and then provide pharmacies with the opportunity to earn Pharmacy Performance Payments based on achieving the three adherence measurements noted in the above list (adherence to diabetes, cholesterol, and hypertension medications). Pharmacies not wishing to participate will be considered out-of-network. Humana notes that the “percentile performance” will be evaluated for each pharmacy based on the number of members they service in each measure. Unlike the Inland Empire Health Plan described above, Humana’s plan financially penalizes pharmacies until they show they can achieve adherence results, which may be outside of their control. Humana will payback, or potentially reward, the top-performing pharmacies. Pharmacies need to be in the top 20 percentile to earn an incentive payment. Pharmacies below 50% will be penalized, as they will not receive any of the amount withheld. Although PHSI is not against pay-for-performance pharmacy plans, PHSI fears that redistribution vs. reward pay-for-performance plans may disadvantage pharmacies serving at-risk patients. It is important that pharmacies are now being viewed as more valuable team members in helping to ensure medication adherence. However, PHSI feels that it is important that adherence be viewed from a shared stakeholder perspective. No one healthcare segment is solely responsible. For example, although a pharmacy may wish to keep a patient compliant on their medication, without a refill authorization from a physician, this may not be possible. Physicians and pharmacists must work together to truly improve these metrics, and health plans need to consider this collaboration when structuring their rewards programs. As more pay-for-performance models emerge, pharmacies must decide whether to participate and if so, how to handle these patients. Pharmacies may wish to flag those patients affect by adherence measures to increase their standards of care for that population. While it is doubtful that care would fall for patients not enrolled in one of these networks, if the incentives to perform well in a pay-for-performance network are high enough, this could elevate the level of care for targeted patients, creating an unintended consequence of two levels of patient care. As more rewards-based plans and redistribution models emerge, expect other health plans to test new incentive strategies in the near future.